To put it mildly, this race was a mess. It started late because the police coverage wasn’t squared away, the course was problematic, and an error from the lead vehicle made a wrong turn that cut a mile from the route. I’ve never seen a race go this badly. This 5K race was sponsored in part by our local Irish pub, Brian Boru. It started at the bar and did an out-and-back route through Portland, Maine. The weather was nicer than expected, and the people were great. Oh, and I took far too many pictures. Cara and I have officially run our very first race in Maine. 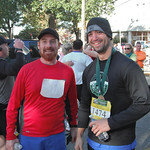 Thanksgiving was coming up and there’s usually a race everywhere that day, so we looked it up and registered. It seemed perfect… downtown, not too expensive, and not too far to run. 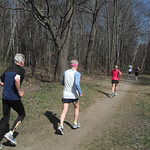 We expected a fun, well-organized race, and we got most of what we wanted. Most, but not all. This was a special race for us. The Chase Away 5K benefits an organization that fights canine cancer, so of course we thought of my in-laws’ dog Socrates. We lost him this year to cancer. 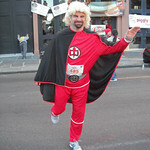 This 5K was Cara’s way of giving him a bit of a send-off. Any race at the Waterfront is an obvious choice for us, especially when there’s a pirate theme. Our friend Misty parked at our place and we walked down there together. It was a fun race overall, but there were a few issues with how it was organized. Mainly the price and the shabby online registration process. 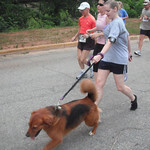 This was another 5K held in Columbia, this time to benefit the Humane Society. Dogs were welcome since pets were the focus of the event. Although Dublin can’t run 5K yet, we were excited to check it out. After all, Cara is in favor of anything that helps dogs. 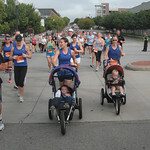 The Jailbreak 5K is a small 5K in Lexington SC, organized by the Sheriff’s Department. Strictly Running handled the clock, so things were pretty organized. They were also pretty humid. You really can’t beat an opportunity like this. The Rosewood Crawfish Festival took place about two blocks from our apartment, and admission was included with registration for this 5K race.